Devi (Chennai, India) on 24 June 2018 in Miscellaneous and Portfolio. All these are drying in the warmth of the sun in the garden :)Each one has a name too. @Nina: I always imgine the they come alive in the night !!!! @Jypyä Pop: Absolutely !! They are all jam packed !!! @grouser: I suppose so grouser. Wonder what happens when the clock strikes twelve times at midnight !!!!! @Dimitrios: Yes..Mild sun and all machine washed...three fourth dry ! @Sam: Thank you very much Sam :)) We never had these when we were small!!!! An impressive collection of 'clean' dolls. They will be good and smell good after they dry. A "big" teddy bear family. @Graciel·la (Vic. Catalonia): Yes...from Great Grandfathers' time ! A cute result this shot. Superbe ensemble de peluches et vue quel rendu des tons et couleur. I love your photo full of tenderness ! Your grand-daughter certainly enjoys having those clean toys! Thank you for your visits Devi, I was so busy these last days! Such a wonderful collection! They are too cute! Of course each one has a name! Lovely treasures - I hope they all dry well. I think they are having a party. @Michael Rawluk: Yes indeed ! They might come alive at nigh !!!!!!!!!!!!!!!!!!! 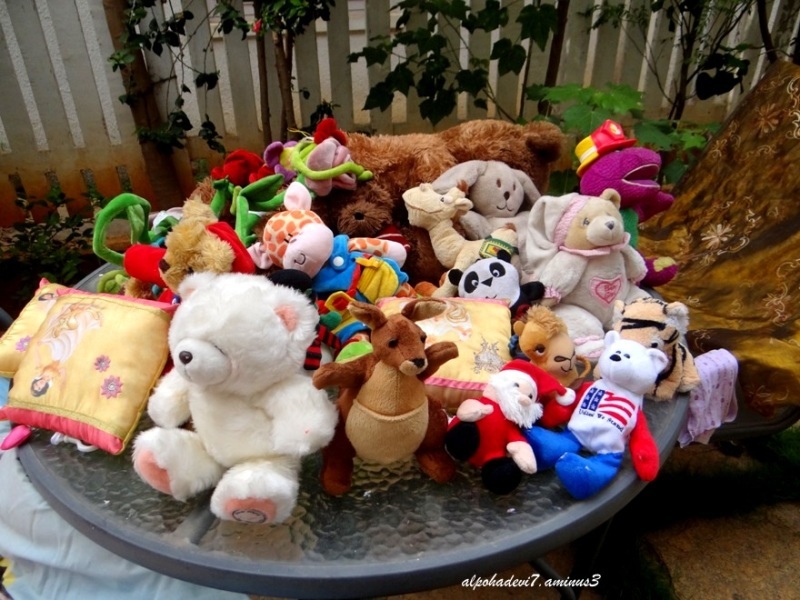 A cute display each waiting for a child's hand and heart!! A mountain of furry critters. Very colorful.